An international team of astronomers has for the first time confirmed a link between the gamma bursts and their counterparts in several radio frequencies, solving the mystery of the origin of the outbreaks. Blazars are among the largest and most energetic objects in the universe. Jets of matter (“jets”) shoot from the cores of these active galaxies shoot, which are accompanied by huge bursts of gamma rays. An international team led by Lars Fuhrmann from Bonn’s Max Planck Institute for Radio Astronomy has now for the first time confirmed a link between the gamma bursts and their counterparts in several radio frequencies. Furthermore, the researchers solved the mystery of the origin of the outbreaks: These come from the immediate vicinity of the supermassive black holes at the center of blazars. Special types of distant active galaxies and their innermost central regions show extreme physical processes. In the vicinity of a spinning supermassive black hole (billions of times heavier than our Sun) an enormous amount of energy is released, often in the most energetic form of light: high energy gamma-ray photons at mega- or even gigaelectronvolt (MeV/GeV) energies. This energy output is produced by feeding the black hole from surrounding stars, gas and dust. Matter is spiraling in onto the black hole and strong magnetic fields channel some of the infalling gas into two powerful, well collimated “jets” of plasma accelerating away from the center with velocities approaching the speed of light. Many of the connected physical processes are not understood in detail so far, for example the production of high-energy gamma-ray photons and their place of origin inside the jet, or the origin of strong outbursts of emission across the whole electromagnetic spectrum. New instruments and observing programs covering a large fraction of the whole energy spectrum nearly simultaneously allow new insights into the extreme physics of these objects to be obtained. Using the measured time delays the team was finally able to estimate distances of a few ten light years or less between the radio and gamma-ray outburst regions. “Based on our delay measurements we could estimate for one of the brightest gamma-ray emitting active galaxies in the sky, 3C 454.3, how far away from the supermassive black hole most of the gamma-ray photons must have been produced. We are talking about only a few light year distances – very close to the footpoint of the jet and the black hole itself!” proudly reports Lars Fuhrmann from MPIfR, the lead author of the paper. “This has serious implications for the physical processes producing the gamma-ray photons!” he adds. In the meantime the team is continuing to use the “Joint Eye” on the universe to collect more data and more events for detailed follow-up studies. 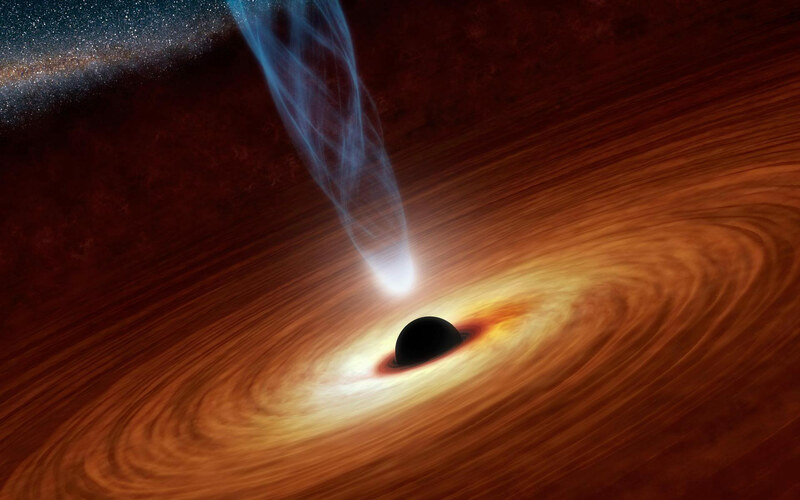 3 Comments on "Astronomers Solve the Mystery of Where Gamma Rays Originate"
With respect to the artist of the above image, isn’t there something wrong with the portrayal of the black hole? Shouldn’t the light from the accreting material behind the event horizon be bent as it passes near the gravitational pit creating some sort of halo effect around it? Can we please exercise a little more rigor in our reporting rather than fishing for website hits with sensationalist claims? Statistical connection, even if “strong” (whatever that may mean in this context), does not equal proof. Jeez let’s use a fictional black hole to explain this. The more likely answer is the electric universe. For those seeking logical answers look up plasma cosmology and electric universe.